Gentile Roma: It’s Been a Slice – that's what Mon said. Tonight is our last night in Rome and I must say, I could not have asked for more. 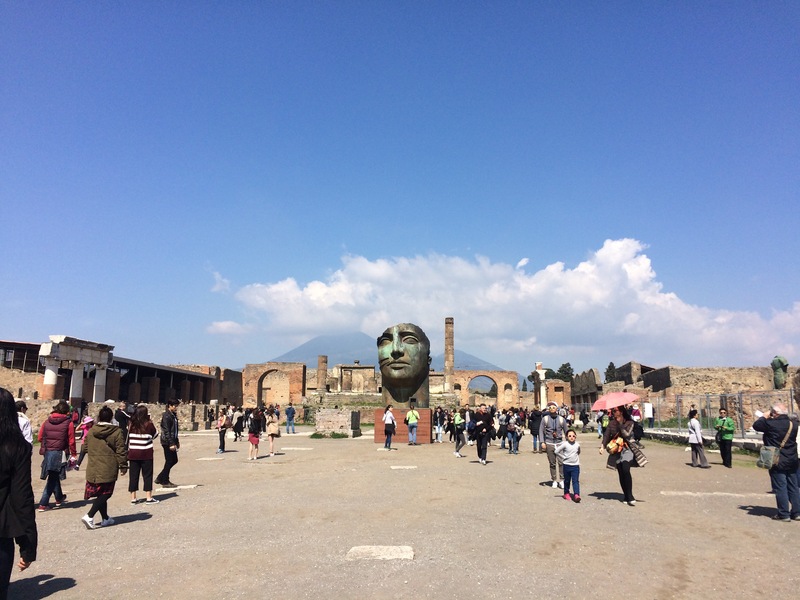 We had the pleasure of seeing so many of the treasures the city has to offer, as well as the excavated ruins of the ancient city of Pompeii in the nearby(ish) Campania region. The Colosseum is undoubtedly the most iconic piece of architecture representing Rome to countless people around the world. 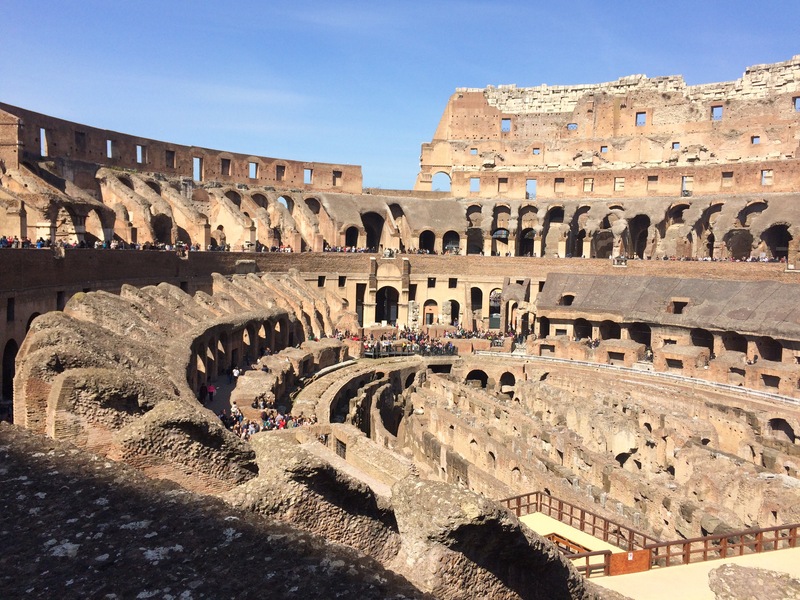 But did you know that the correct name for the structure is actually the Flavian Amphitheatre? The infamous structure received the nickname we recognize it by today, not for its colossal size, but rather because of a 30 meter tall bronze statue of Nero which once stood at the site. The Colossus of Nero was destroyed in the same earthquake that caused part of the amphitheatre itself to crumble. Although the statue no longer stands, the nickname prevails. A short walk from the Colosseum, visitors can see some of the most fascinating remnants of Roman history. The Roman Forum provides the unique opportunity to truly understand how Rome came to be over the centuries. In many instances, astute visitors can clearly see the layers of ancient ruin upon which new versions of the city were built over time. 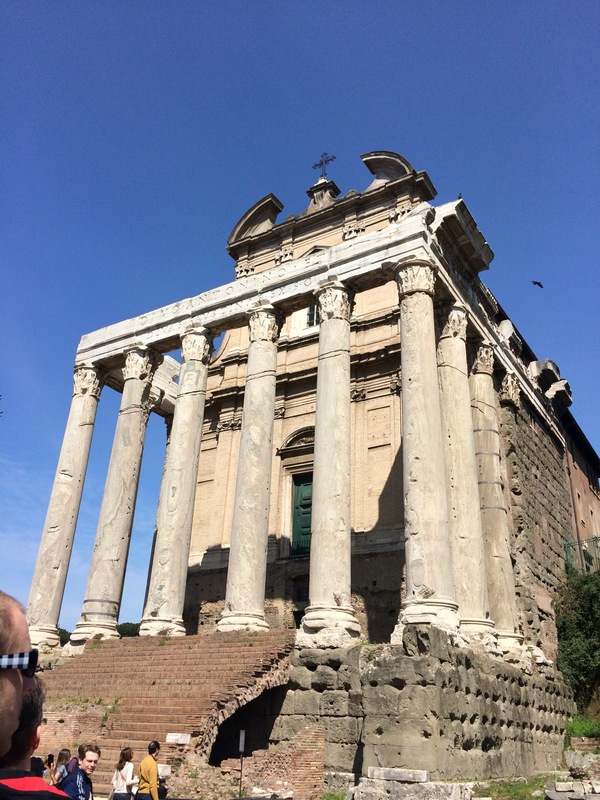 Once a Pagan temple, the structure above was converted into a church with the prevalence of Christianity in Rome. If you look closely you can see that the door appears to be hanging in the middle of nowhere. During the time in which the building was repurposed, the ground had not yet been excavated, so where the door seems to hover was in fact ground level at the time. This is also why Romans during this time period were unsuccessful in removing the temple’s giant pillars – though it wasn’t for a lack of trying. You can still clearly see holes and rope marks from the efforts to remove these ungodly (ha, get it!?) pillars. However, with the base of the pillars firmly planted beneath the rubble, their efforts were in vain. 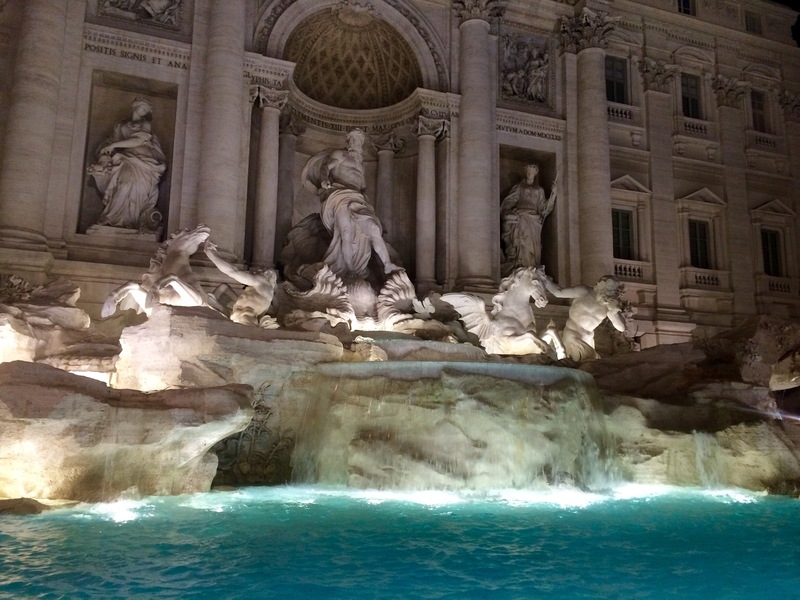 Perhaps the best-known fountain in the world, the Trevi Fountain‘s recently restored façade depicts Oceanus, his chariot being pulled by two sea horses lead by two Tritons, as he stands haughtily under a triumphant arch. Still more breathtaking statues adorn the fountain, including the virgin, who according to legend, helped Roman soldiers locate a much needed source of water in the year 19 BCE. Each day, hopeful tourists throw thousands of Euros worth of coins into the fountain gunning for their wishes to come true. While not located in Rome, the ruins of the ancient city of Pompeii (not to be confused with the modern day Pompei) can be easily reached by car or train from Rome. 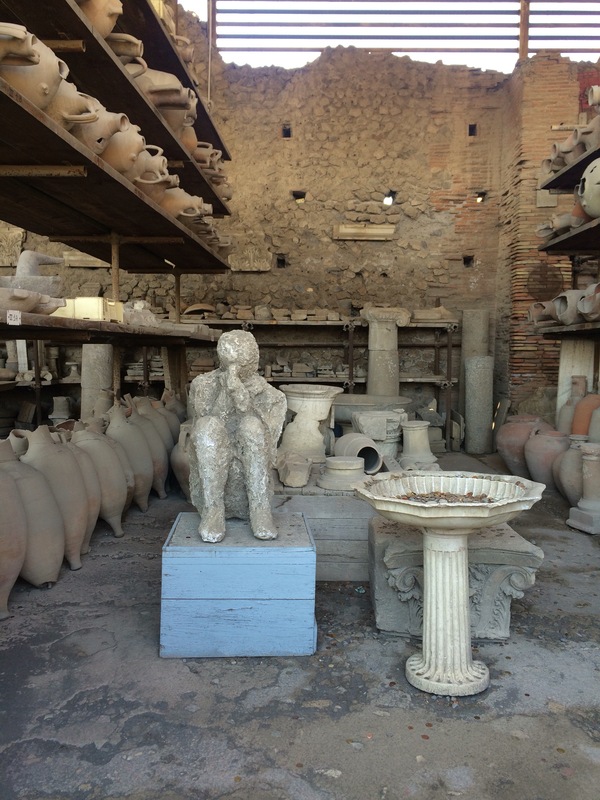 I must say that having read about the tragic end of the people of Pompeii over the years, my walk through the ruins (or the 80% that have been excavated to date) was everything I had hoped for and more. Located near the base of the immense volcano, Mount Vesuvius, Pompeii was once a thriving city with beautifully decorated homes, an amphitheatre for live performances, advanced infrastructure including roadways (with crosswalks! ), a modern water and drainage system, a port and more, Pompeii met its end in the year 79 CE. The eruption of Mount Vesuvius (seen in the distance from Pompeii’s main square, above) left the entire city buried under literally tons of ash, making it unlocatable for approximately 1, 500 years. It is speculated that Mount Vesuvius stood almost twice as high as it does today, the force of the eruption having blown off almost half of the volcano. Upon its eventual excavation, archaeologists found that the layers of debris had not only preserved many artifacts, but had frozen the final moments of approximately 1, 000 of Pompeii’s residents (as well as many animals) in time. The tragic death of the resident above was immortalized by pouring plaster into the void that was left in the hardened volcanic ash and debris which suffocated this man and eventually encased his decomposing body. However, the vast majority of the some 10, 000 residents of the ancient city have never been officially accounted for. It is presumed that many were caught in tsunamis that followed the eruption while they attempted to flee the city by boat. If you enjoyed following my Roman adventure, stay tuned for next time when I recap my upcoming visit to Florence! Thanks for the info, Mon! My hubby, two teenage kids and my own mom are heading to Rome the third week of July. Love to chat (briefly, I promise!) at one of our remaining classes, about your trip! Loved Rome and have so many great memories of the city. Great list of spots Mon – from a personal perspective the only one I would add is Villa Borghese, if for no other reason it’s where I proposed to wife! Have fun in Florence! Ah that sounds lovely! Honestly, there were so many more I wanted to add but had to catch a train in the morning. Enjoying Florence very much so far 🙂 thanks!